GUTHRIE, Okla. – One of the greatest events in Western sports history is about to get even better. The CINCH Timed Event Championship returns to the Lazy E Arena March 3-5, 2017, with a world-class list of top cowboys – titlists like Trevor Brazile, Paul David Tierney, K.C. Jones, Daniel Green, Josh Peek and Kyle Lockett. It will be 20 of the greatest all-around cowboys in the game today, battling through five rounds of heading, heeling, tie down, steer wrestling and steer roping over three days. The Cinch TEC, acclaimed as the “Ironman of ProRodeo,” it is a true test of the athletes’ skills, and a showcase for the thousands of fans who flock to the Lazy E Arena to see the winner pocket $100,000. What makes it even better in 2017 is the addition of the Jr. Ironman Championship, which will be a major test for timed-event cowboys ages 15-20. They will compete in three rounds in heading, heeling, tie-down roping and steer wrestling and for their share of the $20,000 purse; the champion will snag $10,000. It is a rugged test of their talent, horsemanship and stamina over three days. The Jr. Ironman will begin at 9 a.m. Friday and Saturday and 10 a.m. Sunday, with the Cinch TEC performances at noon and 7:30 p.m. on Friday and Saturday and 1 p.m. Sunday. The weekend will be full of activities, from the Cinch TEC pro-am team roping on Thursday, March 2, to the Chuckwagon Cook-Off on Saturday and Finals of both the Cinch TEC and the Jr. Ironman on Sunday. Tickets are on sale now at Ticketmaster.com. With more than 40 events a year calling the Lazy E Arena home, the first weekend in March is truly showcase of rodeo’s established veteran’s and the sport’s up-and-coming stars. The 2017 CINCH Timed Event Championship is sponsored by CINCH, Priefert Ranch & Rodeo Equipment, Montana Silversmiths, ABI Equine, Cavender’s, American Farmers and Ranchers Insurance, Nutrena, Bloomer Trailers, MacroAir, National Saddlery, Cross Bar Gallery, John Vance Motors, Western Horseman Magazine, Spin to Win Magazine, Guthrie CVB, Made In Oklahoma Coalition, Pendleton Whisky, CSI Saddlepads, Sherwin-Williams, Bio S.I. Technology, La Quinta Edmond and the Fairfield Inn & Suites – Edmond. The 2017 CINCH Timed Event Championship is a Lazy E Production. 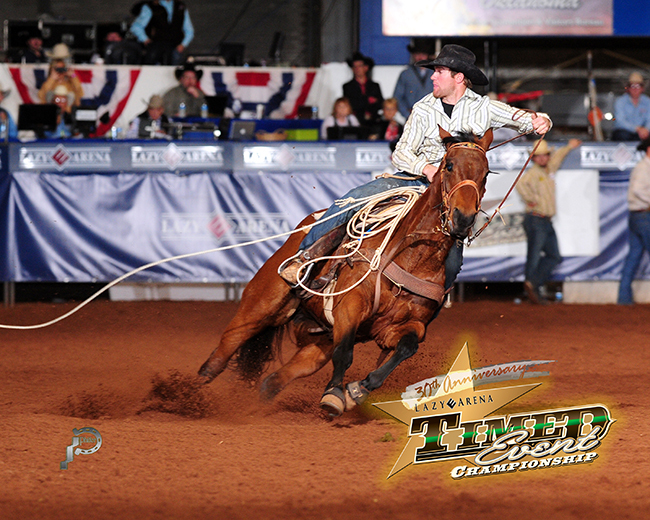 For more information on the CINCH Timed Event Championship or other Lazy E events, contact the Lazy E Arena, 9600 Lazy E Drive, Guthrie, OK 73044, (405) 282-RIDE, (800) 595-RIDE or visit www.lazye.com.